Round decorative air returns are featured in this Renaissance design made with a 1/4" thick faceplate. The white bronze vent covers are strong enough to be used in your ceiling, wall or floor to cover up duct units. Our decorative air returns allow cold and hot air to pass through the vent continuously and are even made with a screen backing. Each bronze vent cover has pre drilled screw holes for mounting quickly on the wall or ceiling. If the decorative air return is being used in a floor application, please make a note during checkout. Our white bronze vent covers are handcrafted in the US by Classic Grilles. Each decorative air return is made by way of a sand cast, giving you a unique product every time. The white bronze vent cover finish has a clear coating applied to protect the faceplate and is similar to a chrome look. Get this round decorative air return shipped straight to your home for one low cost. Also order all your white bronze vent covers together to avoid variations in finish or size. Tip: Order your decorative air return based on the measurement of the walls ductwork opening. One of our white bronze vent covers listed as a 6 inch round will cover a hole opening of that size. For mounting, each decorative air return is made with an additional 2 inches. Sizes are approximations since variation can occur when they made in the sand cast. Important: White bronze vent covers are considered special order, non-returnable items that cannot be canceled once a payment has been received. Because the decorative air returns have to be made by hand, it can take 7 to 9 weeks for them to ship out. 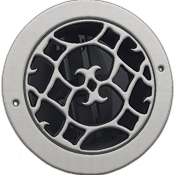 Round Renaissance white bronze vent covers are available with a metal damper which will close off air when distribution is not needed. Also, these decorative air returns come in a variety of styles, all offered and made by Classic Grilles. Replace grilles with white bronze vent covers today to create a stylish and timeless look in your home.